Trip Advisor used Facebook to provide reviews and opinions that are directly relevant to a user’s searches. It uses Graph API, Open Graph, Like button, other Social Plugins and other public data from Facebook profiles to enhance and customize the travel data it already has to help users and share their experiences with their friends. Average user engagement increased 20%. Users connecting to TripAdvisor through Facebook were two times more likely to contribute content than non-Facebook connected users. To reach members of its target audience, Country Crock in the US created a special tab on its Facebook Page where mums could browse recipes like Easy Mashed Gingered-Carrots and Honey-Orange Mixed Vegetables. As part of the campaign, Premium Ads drove engagement by asking questions such as What’s your family’s favorite vegetable?”Each person’s response created a story in her friends’ news feeds, driving more awareness of the message. People who liked the Page also received a 40-cents-off coupon toward their next Country Crock purchase. On its Page, Country Crock generated more than 1,000 likes and comments per post for many of the campaign-related posts. Pocket Gems' mobile game Tap Pet Hotel has an audience of several million active monthly users, many of them playing the game on their Apple iOS devices. Given the concentration of users on the iPhone, iPad, and iPod Touch, Pocket Gems jumped at the chance to utilize Twitter's integration with iOS 5. The development team provided gamers the chance to connect their Twitter accounts to Tap Pet Hotel, and then tweet from the game with just one click. In February of 2012, Tap Pet Hotel sent out over 92,000 Tweets from the game due to the frictionless sharing made possible by Twitter and iOS 5. The Twitter integration in their iOS 5 game has emerged as a primary source of new user acquisition for Pocket Gems. @Etsy noticed early on that a lot of shop owners using their service included their Twitter account information on their shop pages. The team also noticed their community tweeting links to Etsy content, using Twitter as a way to drive traffic back to the site to increase sales. Etsy quickly realized that Twitter’s asymmetric nature presented an attractive opportunity for sellers and their pages, and the team considered how it could use Twitter both to drive purchases for their sellers and to help sellers build a loyal following. Twitter is now used heavily by Etsy sellers with over 1.3 million Tweets mentioning @Etsy in a typical 30 day period resulting in over 825,000 clicks back to Etsy. 58% of those Tweets are driven by the Tweet Button. Nescafe used its Facebook timeline cover photo to illustrate fans "liking" its Facebook page to promote a new tin design. An image of coffee beans in a glass tank was used, and as each fan liked the brand, 1 bean per fan was removed. The more the likes, the less the coffee beans. The stunt was used to engage consumers with the band and create the firs tlook offer on Facebook. The new packaging was revealed in 22 hours. Kellogg's used a pop-up tweet shop in London’s Soho area where people could buy their new savory crisps. The store lets customers try the low calorie snacks, which usually cost 60p per packet, and then asked them to tweet a review on the social media website. Passers-by could walk into the store; sample the range of new cereal crisps and then tweet about them to get a free box to take home. The store turned a customer’s social currency into real goods and positive sentiment. It’s a little unnatural, but then again, experiences like this will probably generate Tweets and Facebook posts without the mandatory requirement too. In honour of Felix Baumgartner’s landmark skydive from the edge of space, Nestle sent a Kit Kat bar into the ether with a video camera. The 'Break from Gravity' project saw the four-fingered chocolate bar sent to a height of 22 miles after beginning its ascent from Cambridgeshire at 11.20am on Saturday (13 October). Camera footage, which tracked the Kit Kat’s ascent and descent, was shared via the brand’s social media channels. Clothing retailer Zappos used Twitter's Streaming API to monitor all the Tweets that mention the brand, streaming them onto an app to answer queries, engage in conversations and showcase its customer service standards. The campaign boosted customer engagement and loyalty, generating over 1,200 conversations per month on the platform. In the autumn of 2012, Nestle launched a (slightly creepy) new promotion for its Kit Kat, Yorkie and Aero bars, embedding GPS trackers in select bars, with the promise to track down the buyer within 24 hours to deliver a £10,000 prize. The UK promotion called 'We will find you', involved six KitKat 4 Finger, KitKat Chunky, Aero Peppermint Medium, or Yorkie bars. Nestlé devised the campaign to appeal to men, and backed the marketing blitz with TV ads and a smartphone campaign. Coca-Cola re-imagined the classic 'Hilltop' commercial for a modern audience, in the digital age. Fulfilling the promise of the original ad, it allows users to connect with strangers by sending a Coke around the globe to an unsuspecting recipient, making the world feel just a little bit smaller. The ad can be experienced on mobile phone apps in Google’s AdMob network, across iOS and Android devices through AdMob rich media ads, coupled with custom-designed vending machines, viewers can buy the world a Coke, with a few taps on their mobile phones. The Sweden institute used Twitter and citizens of Sweden to communicate and position Sweden as a progressive country. The image of Sweden is built with tweets as a dynamic, innovative and deeply human country. The campaign resulted in 26,000 followers from 120 countries in six weeks. 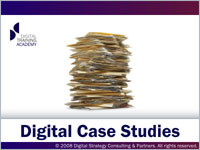 The case featured in all major media globally for a PR value above $19,800,000. Nike introduced FuelBand, to increase the existing 7+ million community of Nike +. “Fuel” is a common, universal metric for activity; “Fuel Band” is a device that you wear device that tracks all your daily activity. Users can set targets and share their measurements with others. If a goal is reached, a motivational character called Fuelie shows up to applaud. The fuel band tracks all activities of consumer and with Bluetooth sync technology uploads all data and all activity is tracked on regularly. With the help of social integration one can see and compare activities with friends and motivates, consistently achieving the targets leads to the character Fuelie celebrating. Topshop attracted more than 2 million people to its live streamed fashion show at London Fashion Week, with the retailer claiming to sell out of some lines during the broadcast. The show, streamed live on Facebook, allowed users to share their favourite looks with friends using the social network. Viewers used ‘open graph’ technology allowing them to post messages about the Topshop show, called ‘Unique’ automatically on Facebook and Twitter. The retailer trended globally on latter social networking site. In a UK first, Marie Claire inserted a video ad on the pages of its October issue, set to play once a reader turns to page 35 and 35. Despite featuring in a limited run, the campaign generated a huge amount of media buzz both online and offline. The Sun worked with Underwired to increase the engagement and revenue on its Fantasy Football league via an eCRM programme. This case study shows how very simple use of customer knowledge can have a dramatic impact on campaign results. After moving away from a volume-based, ‘one size fits all’ approach to email, The Sun saw a 32% increase in ROI and a 16% increase in Average Transaction Value, which nearly doubled the growth in revenue from digital channels. Ubisoft managed to triple sales by 300% in just 3 months through a targeted Facebook campaign for its Settlers Online game by focusing on users most likely to convert and purchase. This case study looks at how the games giant made smart use of targeting and bid optimisation to get the most out of its ad budget.